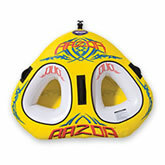 Grab a friend and enjoy the water even more this summer with a towable tube built to bounce over the waves, designed to be ridden by 1, 2 or 3 riders, constructed of heavy-gauge PVC, with molded grip handles and neoprene knuckle guards - all to provide a adrenaline rush white knuckle ride. 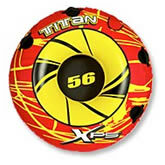 The Bass Pro Shops® XPS Titan 56 Towable Tube is a 56" diameter single-rider tube, with a solid PVC bladder with 840 denier, and 420-denier nylon cover, equipped with four grip handles with neoprene knuckle pads for ease in holding on for a full day of riding the waves. Color: Red, Yellow & Black. 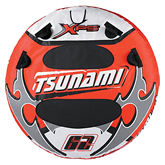 The Bass Pro Shops® XPS® Tsunami 62 Towable Tube is a 62" diameter single rider tube, made out of a heavy gauge PVC bladder, rugged 840 denier nylon cover, with molded grid handles, and two large EVA pads for knee and elbow protection. 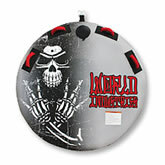 Color: Bright Red and Grey graphics. 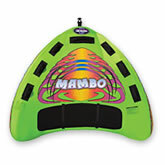 The Rave Sports® Mambo™ Inflatable Towable Tube is a one or two-person rider, high-performance towable ideal for water-sport enthusiasts of all age groups, comes equipped with oversized neoprene chafe guard for maximum protection for legs and knees, and rear straps to aid in deep water boarding. The Mambo measures 70"L x 80"W x 20"H. Color: Light Green & Black. The Kwik Tek® World Industries GRIM Towable Tube is a 60" diameter (deflated) two-rider tube, with a 30 gauge PVC bladder, encased nylon cover, anti submarining, with four easy to grip handles, and fast inflating/deflating valve. Color: Grey, Black, & Red. The Bass Pro Shops® XPS Titan 62 Towable Tube is a solidly built 62" two-person tube, with a heavy gauge PVC bladder construction, inflatable bottom design for a smooth ride to jump those waves for longer. Four EVA foam grip handles allow for ease in holding on, and equipped quick inflate/deflate values. Color: Green, Yellow, & Black. 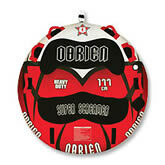 The O'Brien® Super Screamer is a two-person towable tube, 70" diameter, six grip handles, with a 30 gauge PVC bladder, encased in a durable 840 denier nylon cover, and equipped with fast inflate/deflate valve. Color: Red, White & Black. The Rave® Sports Razor™ is a two-person Inflatable Towable Tube, with a sit-up position design, built in a heavy-duty PVC bladder, with Skin Fast™ material on the bottom for an incredible ride, 4 soft handles to grip, and re-inforced tow system. 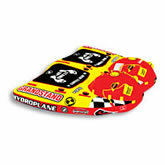 The Sports Razor measures 74" x 58" x 16". Color: Yellow, Red, Blue & White. 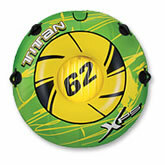 The Bass Pro Shops® XPS Tsunami 76 2-Person Towable Tube is a big 76" diameter dual rider tube, constructed of a heavy gauge PVC material, with a rugged 840 denier nylon cover, molded grip handles, and a quick deflation and inflation valve. Color: Purple, Grey, and White. 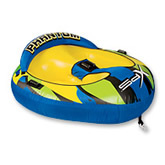 The Bass Pro Shops® XPS Phantom Towable Tube is a two-rider towable with a dual cockpit design surrounding both occupants, with a high back seat, inflated bottom floor to absorb impact, and built in a heavy gauge PVC bladder material, with molded foam grip handles. Color: Blue, Yellow, and Green. The SportsStuff® Grandstand II Towable Tube is a two-rider tube with multiple riding positions for even more fun on the water - Lie Down, Sit Down, or Stand like a water skier, all equipped with dual steering leashes, versatile grip handles, constructed with a durable PVC bladder and heavy duty nylon cover. The Grandstand II measures 82" x 98". Color: Bright Yellow, Red & Black. 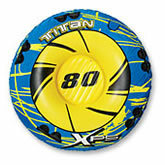 The Bass Pro Shops® Titan 80 Towable Tube is a 80" diameter three-person tube to deliver high-speed thrills all day long, with a solid heavy gauge PVC bladder construction, inflatable bottom for a smooth ride, and easy to grip molded handles with neoprene knuckle pads. Color: Bright Blue, Yellow & Black. 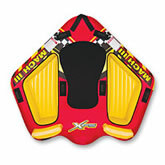 The Bass pro Shops® XPS® Mach III Towable Tube is a 90" diameter three-person tube, with a solid heavy gauge PVC bladder, with a one deck and two cockpit rider set-up, foam grips handles for ease in holding on, and quick inflate/deflate values. Color: Red, Yellow & Black. 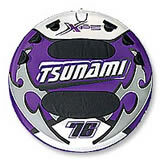 The Bass Pro Shops® XPS Tsunami 95 3-Person Towable Tube is a huge 95" diameter three-rider tube, built in heavy gauge PVC bladder to skim and bounce the waves all summer long, with eight padded handles, neoprene knuckle guards, and two EVA pads on top stops a rider from skidding across the tube in high-speed turns. 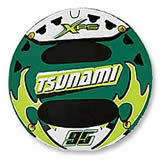 Color Bright Green, Black, & White Graphics. 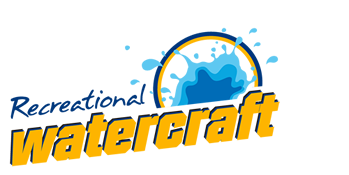 Also - You can find towable water tubes at Boat or Marine stores, or online at places such as Bass Pro , West Marine , Overton's or Amazon for a large selection of 1, 2 or 3 rider tubes.